Learning Management System for the EASO Training Curriculum. The EASO COI Portal provides access to Country of Origin Information (COI) for use in Protection Status Determination procedures. EASO Quality Assurance Tool is a flexible tool for assessing the quality of the asylum process. 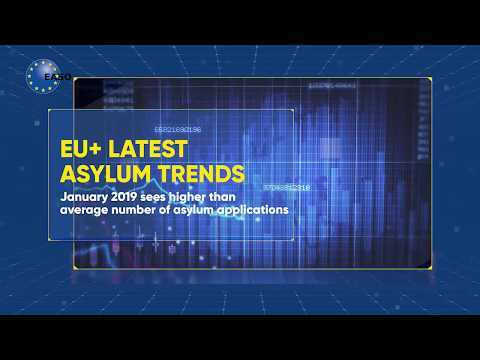 EASO provides, on a regular basis, an outlook with an analysis of asylum trends and push–pull factors, as well as risk scenarios. Some 57 000 asylum applications were lodged in the EU+ in February. The main countries of origin of applicants were Syria, Venezuela, Afghanistan, Iraq and Nigeria. EU+ countries issued about 46 000 decisions in first instance. 36 % of all decisions granted EU-regulated protection, mostly refugee status. Some 450 400 cases were pending at first instance at the end of February, stable with the previous month. Today, the European Asylum Support Office (EASO) published a Country of Origin Information (COI) Report entitled 'Afghanistan Key socio-economic indicators. Focus on Kabul City, Mazar-e Sharif and Herat City'. In 2018, Afghanistan ranked second in the top countries of origin in EU+ countries, with 45 300 applicants. Today, the European Asylum Support Office (EASO) published a Country of Origin Information (COI) Report titled Iraq: Security situation. This report is part of a series of Iraq reports produced in 2018-2019. These reports cover actors of protection, internal mobility, key socio-economic indicators, and targeting of individuals. The reports provide information relevant for international protection status determination for Iraqi asylum seekers, and will be used in the development of a country guidance note on Iraq.